Sod installation is a big project and not one that you should trust to just anyone. The end results have more to do with how the ground was prepared prior to installing the sod and what was done afterwards. Since 2011, Giving Hope Lawn Management has been providing sod installation services throughout the area, we have the experience need to get the job done right. It seems as if no matter how well you care for your yard, eventually everyone needs lawn installation. Whether you suffered through heavy storms or an unusually cold winter season, many yards wind up losing their healthy grasses. While you have many choices for growing a new yard, sod installation is often the top choice for many. 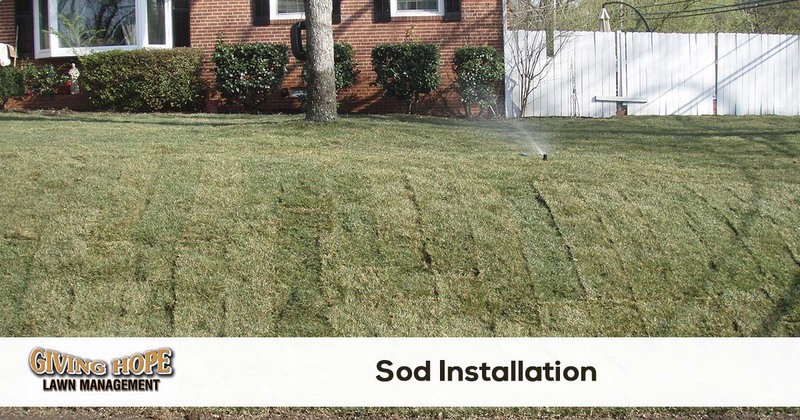 But while sod is the most efficient way to improve your lawn’s appearance, it may also prove expensive. That is why Giving Hope Lawn Management continues to provide fast and affordable sod installation services. We ensure that you receive your best yard for less! Since 2011, we’ve helped more area homeowners and businesses improve their curb appeal without spending a fortune. When you need a better yard without paying too much, we are ready to assist you! Call today for your best lawn installation. We achieve the perfect yard every time! Installing your new yard requires particular attention to both the fresh grass and the soil underneath. Without the correct soil composition, your new lawn will merely die out! Instead, you deserve a team that never cuts corners on quality. We take the necessary steps to guarantee your best yard without issue. First, the site requires the existing vegetation must get removed first. In areas with only dead grass, that’s likely not an issue! But when you have other plants that need to continue growing, it may pose too great a challenge for many service providers. But when you call us, we can always achieve the best yards possible with ease! After the initial preparation, the soil is tilled and chemically balanced. Once it achieves the optimal pH levels, we can install your new grass! The new sod rolls can get cut to fit any shape of yard you have. Even with irregular lawns, our services get the best results each time! For over seven years, we’ve helped more homeowners and local businesses enjoy a quality yard. When you need to know your sod won’t burn out, we always get the job done right! We have everything we need to produce a lush new yard that continues growing for quite some time. Because we take steps to prepare your lawn, soil, and new sod correctly, it remains in the best hands each time. Whether you’re planning an entire yard installation project or just a portion of your lawn, we make sure you get the installation services that you deserve. Call us for all your sod service needs. No matter what you need for the perfect yard, we’re here for you! Before you choose just any landscaping service for your new sod, make sure you get the expert turf providers. Call Giving Hope Lawn Management today for the best new yard installations! Ready to have sod installed on your property or just need a quote? We make it easy to get a free quote and schedule your service. All you need to do is request a quote online or give us a call today!